of affordable all wood dollhouse kits! Single room furniture kits allow you to get only the rooms you need! These great furniture kits from the Corona Concepts Series will complete your house in no time! The details are what will make your miniature dream house stand out and be noticed! These outstanding dollhouse accessories will help complete your unique miniature project. FACT: The tab and slot construction of our wooden birdhouses are what led Greenleaf to manufacture dollhouses. These beauties look as good indoors as they do outside! A great place for info on all things miniature! Mini Swaps, Community Building Projects or contests, there is always something interesting going on at this award winning forum! Visit our library where miniatures are the reality, with articles written by hobbyists just like you! Come see how others have decorated their dollhouses or maybe post pictures of your own miniature masterpiece for all to see! Exclusive web content that will assist you in building your dollhouse plus unique finishing tips that will reveal the true potential of your house! The Greenleaf FAQ is constantly being updated so check back often for answers about your favorite dollhouse! Can't find those pesky instruction sheets you need to finish your dollhouse? No worries, check here to see if they are available online! 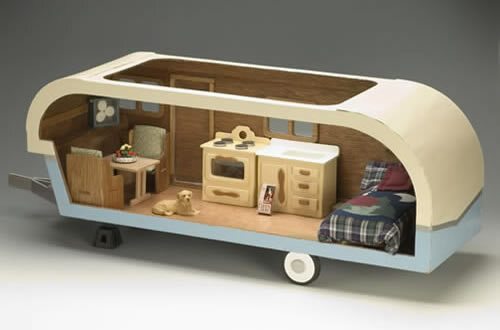 Find an Authorized Reseller of Greenleaf and Corona Concepts Dollhouses near you. Can't find the dollhouse you want at your favorite store? Buy it factory direct from our Company Store! Greenleaf periodically releases products that are only available through our Company Store, so stop by often to see what's available! The story and people behind the worlds largest and oldest dollhouse manufacturer. Need to get in touch with us? Here is the place to find out how, where and when. 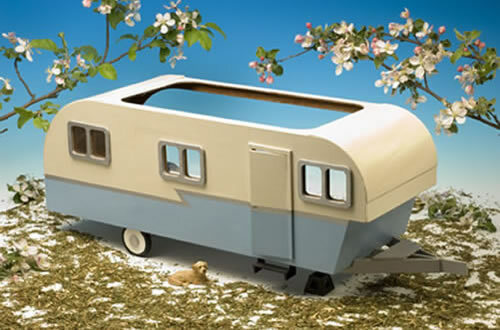 Miniature Travel Trailer for your Miniature Home! You may not find a house in every place you roam but when you have a travel trailer you always have a home!!! Our design was inspired by a simple, less hectic time and a desire to preserve vintage Americana. We've even included a shelf and a dowel stick so that you can use the large window as counter which is reminiscent of an old hot dog vender you would find at the beach! Use your imagination and a little creativity and make this one your very own. The Greenleaf Company Store - Photos include a zoom tool so that you can see detail like never before. Visit the Miniature Travel Trailer page to see for yourself! The Miniature Travel Trailer Construction Blog - Detailed photos of the assembly process can be found along with finished pictures at our construction blogs. Unfortunately, the blog for this house is currently unavailable. Teresa Martens Owner's Gallery - Teresa has a great looking house here! Lucky for us, she changed her mind on the color so it's like viewing two different houses. Visit Teresa's Miniature Travel Trailer and you won't be disappointed! If you have pictures of your dollhouse that you would like to have considered for viewing from this page, please feel free to post them in the Owners Gallery at the Greenleaf Miniature Community. It's free and it's fun! For more information, please visit our miniature forum for details on how to join! The Greenleaf Construction Blog - Follow step by step instructions that are photo documented by skilled miniaturist who not only offer construction advice, but decorating tips as well. These blogs are written in plain English by everyday folks and are fun to follow. Visit our Dollhouse Blog today! Greenleaf's Frequently Ask Questions - Our ever growing FAQ system is available around the clock. When you submit a question in this area, it will be answered by our highly trained Product Specialist and then it becomes a permanent part of our FAQ to help others like yourself in the future. Visit the Greenleaf FAQ today! The Greenleaf Miniature Community - The Greenleaf Miniature Forum is a wealth of information on not just our dollhouse, but on all things miniature. With advance search features and a friendly member base, you can just read or post a question for peer to peer support. The Greenleaf Support Staff - Our support specialist are available for LIVE CHAT SUPPORT by clicking the button below or you can call TOLL FREE Monday through Friday 7AM - 3:30PM EST at (800) 253-7150. If you prefer, you can use our WEB EMAIL form which is available on the Greenleaf Dollhouse contact page. Dollhouse Ownership - Affordable and Fun! The Greenleaf Company Store - Buy factory direct from Greenleaf Dollhouses Company Store! 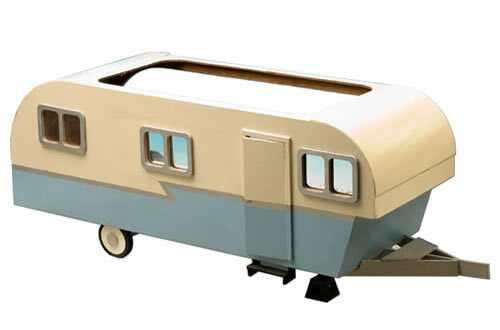 Visit the Miniature Travel Trailer at our online store for even more info and pictures as well as purchasing information! Educational Institutions - Greenleaf Dollhouses offers a wide range of products for both the higher education and K-12 segments. Greenleaf wooden dollhouse kits meet the specific needs of these two distinct groups - keeping in mind budget concerns and time constraints. High quality, reliable and affordable products coupled with our interactive web content help students and administrators save time and become more productive. Our dollhouses are fantastic learning tools and are used in Housing and Interiors as well as Family and Consumer Science classes around the country! Besides making learning fun, it promotes group interaction and the ability to follow directions. Contact Greenleaf Dollhouses today for special educational institution pricing.